When I saw that quote on Reddit, it immediately rang a bell. It seems that most of us (all of us?) 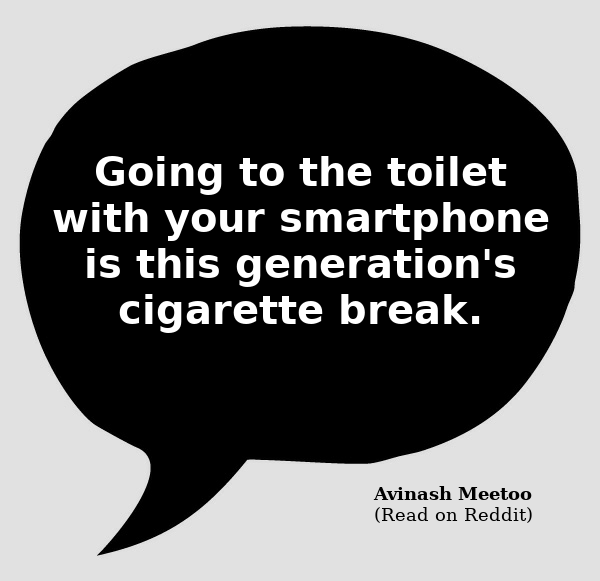 bring our smartphones everywhere now (including, of course, the toilet). We can’t live without it and a decent Internet connection. But it this a bad thing? You never feel stupid. Any question asked by anyone else has an immediate answer thanks to Google and Wikipedia. This can even make the conversation richer and more interesting by going off tangents. You always have some music to listen to. You always have something interesting to read while waiting for you know what. Sometimes some listen to music too much. It’s good to be able to enjoy the silence.